Fall is officially here, and you know what that means— pumpkins and pumpkin spice are everywhere. It is amazing how quickly you shift from summer fruits to fall desserts. Within days, my house was infused by the smell of pumpkin vanilla candles, my kitchen smelled of pumpkin cookies, and pumpkin spice lattes are my new favorite treat. I couldn’t help but get right to baking some of my favorite fall pumpkin cookies. Each cookie is less than 100 calories and is the perfect healthy treat. Whether you want to enjoy them for breakfast or as an afternoon snack with your kids, these are so chewy and delicious. Here is my first recipe of the season, and I am excited to share many more of my fall pumpkin favorites. 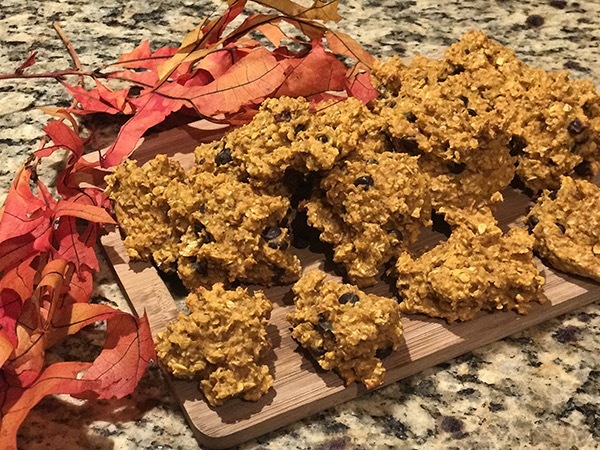 I hope you like these Chewy Oatmeal Pumpkin Cookies as much as my family and I do. Enjoy! 2. Place all ingredients, except optional add-ins, in a bowl and mix well. Option to place in mixer, although not necessary. 3. Line cookie sheet with foil and spray with coconut oil nonstick spray. 4. Fold in optional add-ins, if you decide. 5. Spoon dough onto cookie sheet. 6. Bake for 15-18 minutes, until golden brown. 7. Allow to cool, and enjoy!